Though there were a fair amount of missed blocking assignments on Saturday, Michigan State deserves some credit for the way that they defended the Michigan offense, particularly the way they tried to hold down Denard. Primary among their schematic counters to Denard was blitzing both outside linebackers and spying Denard with middle linebacker Greg Jones. This strategy did a few things effectively: More important than the blitzes actually getting to Denard was keeping him in the pocket. The blitzing outside linebackers acted as contain players while also bringing extra heat on passing downs. This obviously leaves them susceptible to some passing plays (Webb TD below), but they more or less kept Denard in the middle of the field where MSU's best defensive player was waiting. The blitzes also made sure that Denard couldn't beat them on scrambles. With Jones spying Denard--and sometimes coming on a delayed blitz--the MSU defense was daring Denard to sit in the pocket and beat them through the air. We saw how that ended. But that was only when the pocket wasn't moving. 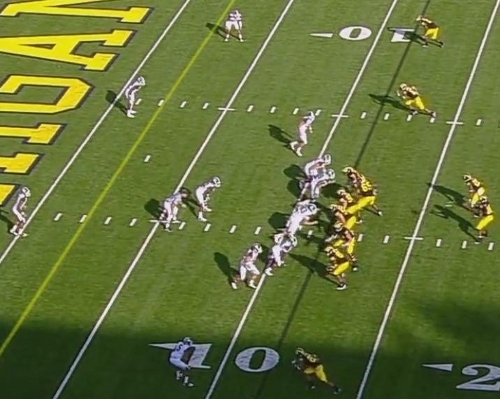 When MSU blitzed their outside linebackers and Michigan moved the pocket, it forced Greg Jones to track Denard to the playside of the field and essentially opened up the entire backside of the play. One of the ways MSU was so effective against Michigan on Saturday was because they were overselling to the playside. Michigan has almost no counter plays in their offensive arsenal, and on the zone read, MSU defensive ends were instructed to always stay high, forcing Denard to hand the ball off. So no matter what Michigan ran, MSU was flowing downhill into the play. Michigan did run at least one counter, however, and it was the walk-into-the-endzone Martell Webb touchdown in the second quarter. 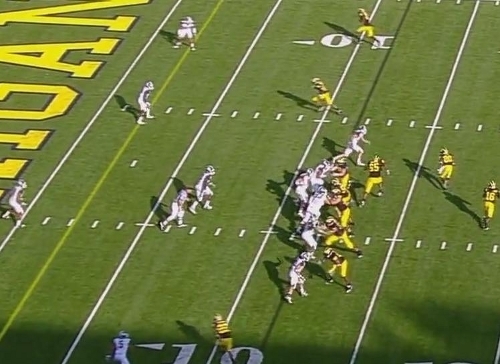 Michigan is in a three-wide set with Shaw in the backfield and Webb blocking on the line of scrimmage on the weakside of the field (bottom of the screen). Michigan will roll the pocket toward the strongside of the field. MSU is in their base 4-3 set. They will rush all four down linemen and the two outside linebackers. As the ball is snapped, you can see the outside linebackers beginning their blitz. 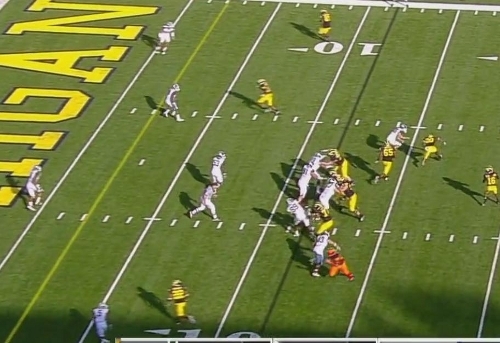 Greg Jones is standing unmoved in the middle of the field and will begin to roll with Denard when the pocket moves. Shaw is heading upfield as the lead blocker and right guard Patrick Omameh is beginning a pull block to also block for Denard in space. As the play develops, it looks very much like one of the run-pass options that Denard usually throws into the flat for five yards. Webb is still on the weakside of the play. His job is to make the blitzing outside linebacker think it's a run play and then sneak out into the flat for an easy touchdown. Greg Jones is now rolling with the pocket and the weakside receiver (Stonum at the bottom of the screen) is vacating the area that Webb will catch the eventual touchdown pass. This is the interesting moment in the play. With numbers in front of him, Denard pulls up on the run play. This tells you either that this was a designed pass to the weakside or Denard made a poor read (despite the outcome; for the record, I'm almost sure it's the former). 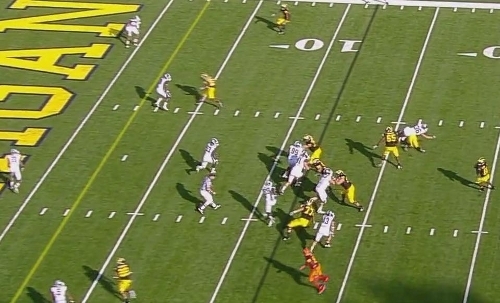 Webb, who is highlighted in red here, effectively sold the run and is now sneaking past the blitzing linebacker. This screen shows explicitly that this was a designed pass play. Shaw has cut blocked the blitzing linebacker on the strongside of the field, and Omameh who was pulling toward the strongside of the field is now out in space with no one to block (his assignment, had this been a run, would've been Greg Jones). If this wasn't a designed pass, Denard runs into the endzone untouched. Instead, Webb (highlighted) is wide open in the flat, and MSU's defense has completely bought the fake despite being helpless to stop either the run or the pass. MSU got a lot of positive plays on gambles like this. Blitzing their outside linebackers frequently gave Michigan opportunities that they just couldn't capitalize on, either because of a poor play by Denard (these were new looks and he was noticeably uncomfortable for most of the game) or just the wrong playcall against it. This scheme was another example of teams being able to neutralize Michigan by attacking the line of scrimmage, which Notre Dame had some success doing. Michigan is unlikely to see this exact scheme in the future because they now have real game experience with it, and because there aren't a lot of teams that have the kind of confidence in their middle linebacker as MSU does in Jones. However, teams will continue to blitz their linebackers to try and close off any holes for Denard to run through. Unfortunately, Iowa, Ohio State, and Wisconsin all feature stellar defensive lines and shouldn't need as much linebacker help in Denard support. The offense against those teams will probably look similarly sloppy despite their linebackers not blitzing as much. Regardless, Michigan needs to implement more counter plays like the Webb touchdown if they're going to keep defenses honest. so how would you counter the OLB blitz/ILB spy? One way to attack any blitz is to "throw into it", which is to say you throw to the vacated spot. This play is a decent example of that but succeeds more because of trickeration. 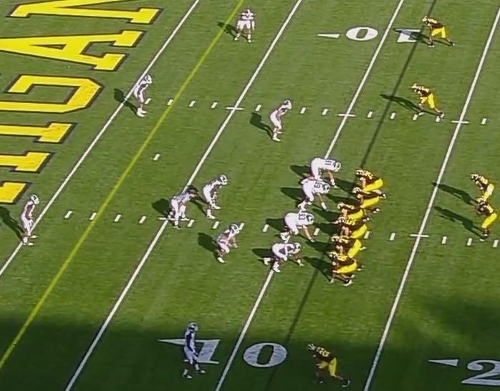 With a mobile QB like Denard, however, and against this scheme in particular, it would've been nice to see Michigan run the QB lead draw that was really effective early in the year (and that Michigan has gone away from in the last few games). If a team is leaving the middle linebacker as the only underneath defender in the middle of the field, Michigan should run between the tackles with a lead blocker (Hopkins or Shaw, preferably) to block the MLB and put Denard in space against deep safeties.